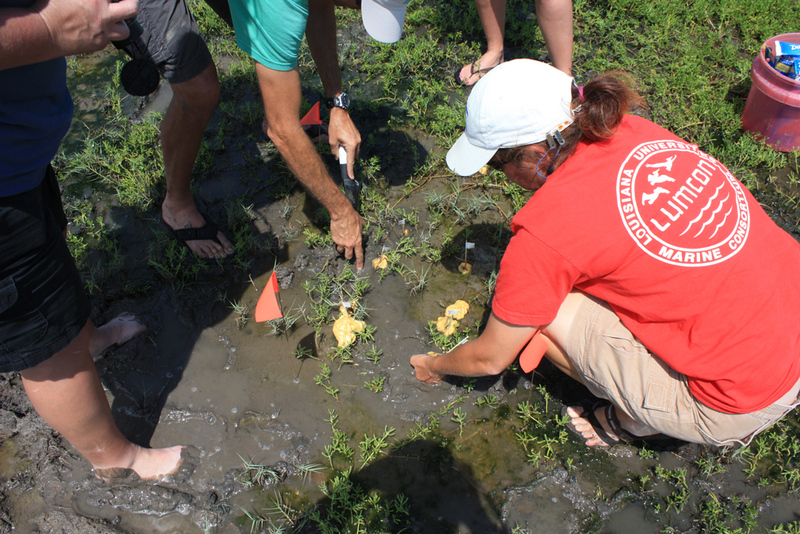 Scientists and marine educators with the CWC held three multi-day workshops taking local teachers through a “day-in-the-life” of field researchers whose work focuses on understanding long-term impacts from the Deepwater Horizon oil spill on marsh flora and fauna. 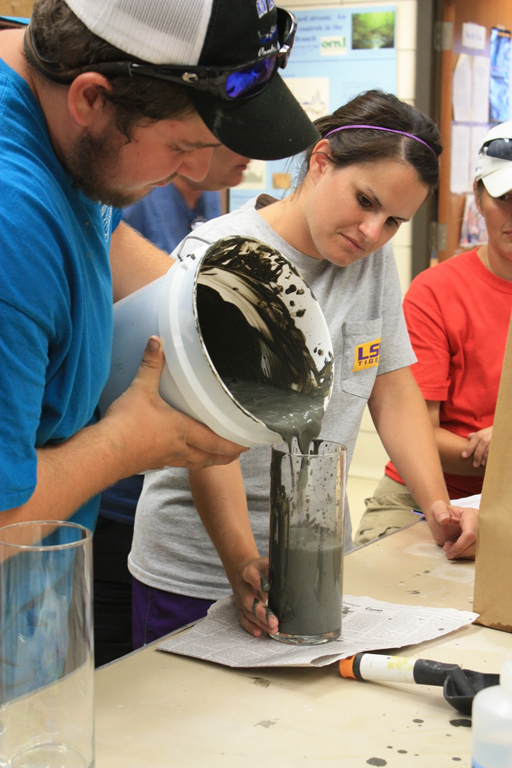 Participants received professional development credits for the state of Louisiana, and they came away with working knowledge about the realities and processes involved with ocean research. The science and math teachers who attended these workshops definitely got their feet wet – and often the rest of themselves – working alongside scientists. They walked through estuarine marshes, sometimes losing shoes in the mud, to collect sediment-dwelling organisms. They waded in coastal waters to net birds and insects in the adjacent marsh. They collected water samples and dealt with challenges of working on research vessels. Then they brought it all back to the lab to get the information they needed to complete the cycle. In short, they did everything scientists do. The first workshop, Marsh Edge‐U‐Cation: Stalking the Seaside Sparrow, was a two-day workshop in March to teach educators about monitoring coastal sparrows in the wake of the oil spill. The program, led by Dr. Sabrina Taylor and graduate student Christy Burns of Louisiana State University, showed that studying one population of birds can reveal volumes of information about an area’s environmental health. After discussing methods to gather data on sparrows such as mapping, modeling, and field work, educators went into the marsh and collected some birds. They learned how to gather data about the birds while in the field and afterwards to release them, unharmed. Teachers gained understanding about the importance of marshland ecology and how contaminants can travel geographic distances through organisms. The second workshop, Ship Time & Shoreline, took place over a week in July. 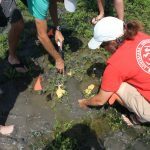 Marine educators and scientists took teachers on daily excursions using research vessels and kayaks into area waters along marsh shorelines. 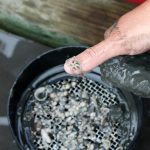 They engaged in a wide variety of data collection activities, from assessing water quality and analyzing sediment cores to extracting burrowed fiddler crabs and netting minnows and small birds. After mornings in the field, they returned to the lab for analysis work. Each day ended with discussions on sharing the data with their classroom students. Drs. 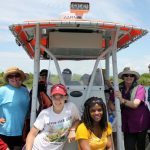 Linda Hooper-Bui, Sabrina Taylor (LSU AgCenter), John Marton (Louisiana Universities Marine Consortium – LUMCON) along with Tiffany Warner (LSU) and Wendy Morrison (LUMCON) participated in this program. 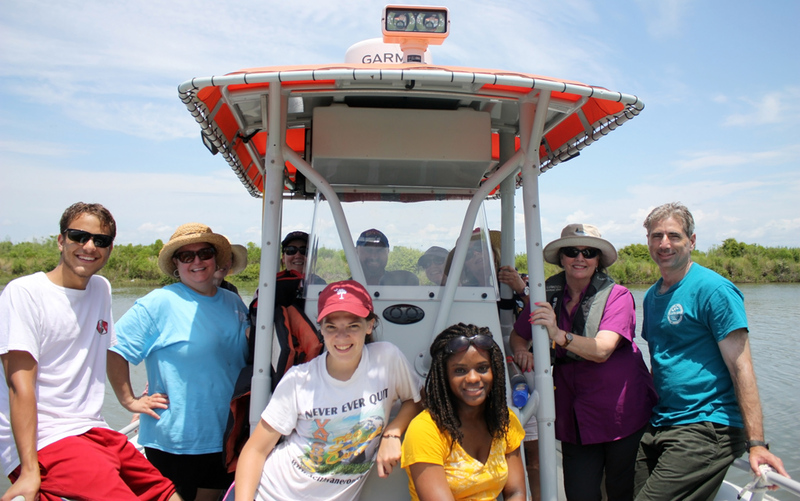 The third three-day workshop in October, In-Depth Investigations, went beyond the marsh edge environments to explore deep water habitats of the Gulf of Mexico. In-Depth Investigations included classroom simulations of real-life challenging situations that researchers often face when conducting work at sea. The teachers’ mission for this exercise was to measure the sea floor depth, but with an added twist: they pulled scenarios from a box – hurricane, sick crew, late departure – and then adjusted their plans accordingly. The experience of dealing with frustrating and difficult situations helped teachers understand that scientists have to think on their feet to get things done. Read more information about CWC research at http://cwc.lumcon.edu/ and follow the CWC Education Blog at https://cwceducation.wordpress.com/. 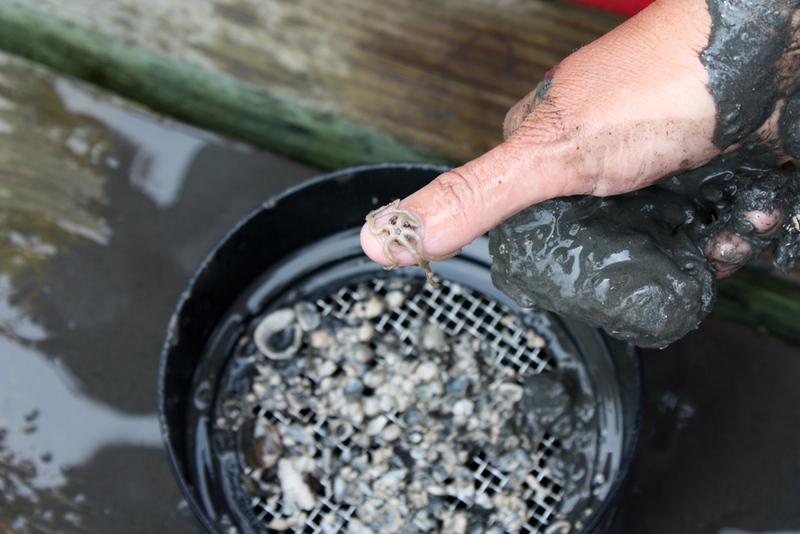 This research was made possible in part by a grant from BP/The Gulf of Mexico Research Initiative (GoMRI) to the Coastal Waters Consortiumdirected by the Louisiana Universities Marine Consortium. The GoMRI is a 10-year, $500 million independent research program established by an agreement between BP and the Gulf of Mexico Alliance to study the effects of the Deepwater Horizon incident and the potential associated impact of this and similar incidents on the environment and public health.